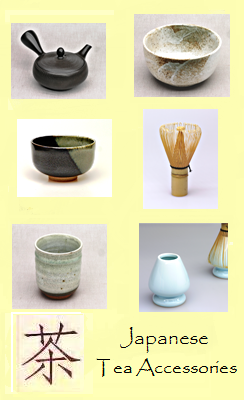 Japanese Tea Accessories: Kyusu teapots, Chawan tea cups, Matcha cups, Matcha whisks and instruments, etc. Japanese ceramic vessels for cooling down water (Yuzamashi) to the right temperature needed to prepare tea. Tea caddies and Matcha containers from Japan and elsewhere for the proper, convenient and decorative storage and transport of loose leaf tea and Matcha powder. Decorative and useful instruments for Matcha tea preparation, such as Matcha whisks, Matcha spoons, Matcha whisk stands, etc.